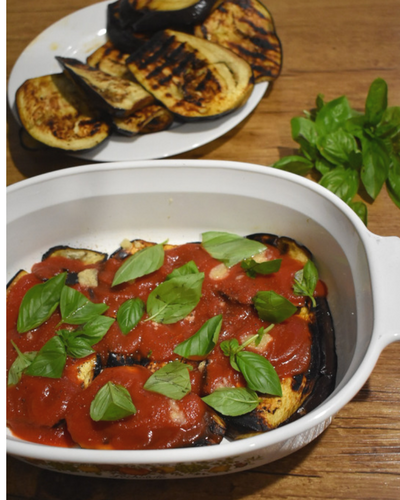 What do you do when you have an excess supply of homegrown eggplant and basil? Why you make eggplant parmigiana of course! 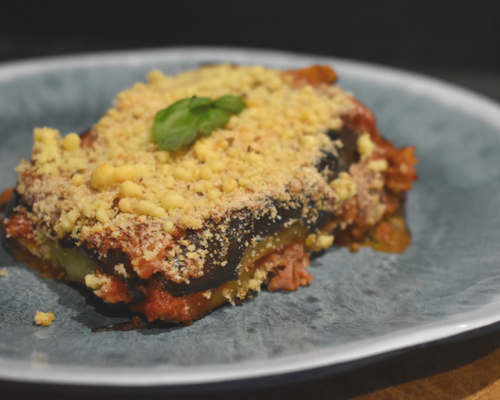 This is my abridged version of the traditional Italian recipe for Eggplant Parmigiana. I tried to make it as healthy as possible because balance is important! This makes a delicious side dish and would be excellent to take along to a dinner party or BBQ. It's also vegetarian, so that's an added bonus for those who prefer not to eat meat or are trying to cut back a little. You can also add shredded ham into the layers for extra flavour (this version is obviously not meat-free). 2. Cut the ends off the eggplant and slice lengthways into pieces about 1.5cm thick. 3. Heat a griddle pan on high heat and grease lightly with oil spray. 4. Place the eggplant slices in the griddle pan and spray the sides that are facing upwards with a little more oil. Grill the eggplant in batches until each side is nicely coloured (it will have black grill lines on it), turning to cook both sides. Remove them from the pan when the eggplant begins to soften slightly. Set aside on a plate to cool as you get on with the next batch. 5. Grease a medium-sized casserole dish with oil spray. 6. Place a layer of eggplant in the base of the casserole dish. 7. On top of the eggplant, pour an even layer of passata and spread it out to coat the eggplant, right to the corners. Place one third of the basil leaves on top (space them out), sprinkle a third of your garlic on and season with salt and pepper. 8. Repeat step 7 until you get to the final layer of eggplant. On the final layer, evenly sprinkle the breadcrumbs over the top and then finish off by sprinkling the parmesan cheese on top. 9. Bake for 30 minutes, then remove from oven and allow to cool for a further 30 minutes before cutting and serving. Buon Appetito!